Newly Qualified Solicitors - Don't Panic! 1. When should I register? 2. How much should I be paid? 3. What does NQ or PQE mean? 4. I am not sure if my current firm will be keeping me on - what should I do? 1. As early as you can. Unless specialist. register with a number of job boards and agencies. Very important to get wide coverage of all options. Give no-one consent to send out your CV without your permission. 2. Depends on circumstances. Visit our website for salary reviews or email to ask us. 3. Newly Qualified and Post Qualification Experience. 4. Look around as much as possible and use any job offers to lever an offer out of your existing firm if you want to stay. Visit our website at https://www.ten-percent.co.uk/newly-qualified-solicitors/ for further advice. 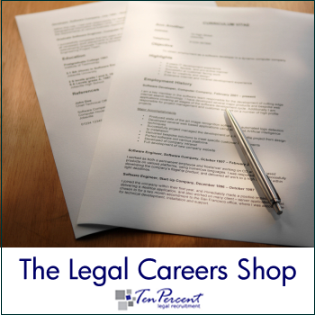 Selling Training Contracts and Work Experience - is it legally and morally acceptable? We have recently heard about a firm in the North of England offering training contracts for £20,000 and work experience for a lot less. I suspect the Law Society may have something to say if anyone ever reported the firm for doing this, but we were thinking about it from a moral standpoint. Many years ago we were approached by a redundant manager from a large manufacturing company who had taken an LLB and LPC in his later years. He could not get anything from any law firm, which was fairly understandable as he had no experience and academic performances were not great. This candidate came up with the idea of offering to buy the equity of a law firm. My understanding is that he was intending to purchase part of the freehold or leasehold of a law firm's building and then waive the rent over a period of time in return for the chance to do work experience and a training contract with the practice. I recall that he had a number of serious enquiries! Even if it was legal to sell training contracts, I hope we do not go down that route as a profession. It seems that the entrance into law is so easy with every university selling LLB courses, LPC and BPTC qualifications for figures seemingly plucked from the sky, but no-one ever gives the harsh reality of how much a law student would be earning once they have qualified into any firms other than central London commercial firms. I reckon I would have been happy to pay about £5,000 to do a 2 year training contract in a decent commercial firm. How much would you have forked out? Jonathan Fagan is MD of Ten-Percent Legal Recruitment, a non-practising solicitor and legal careers coach. Labels: Training Contracts - buy your own? We received our copy of the Law Society Gazette yesterday with an advert attached for Quality Solicitors. They have teamed up with WHSmiths to offer legal services from a range of WH Smiths outlets and there appears to be a recruitment drive for more firms to join the operation in light of this and other expansion. I was thinking about the WH Smith side of things and noticed that the advert gives 2 scenarios for customers considering which solicitor to instruct - Scenario 1 - Yellow Pages, telephone quotes, internet search and then needing to book time off work to see a traditional solicitor operating during standard office hours, unfriendly receptionists giving quotes, paying up front fees, and nervousness about being in a solicitors office. Scenario 2 - go into WHSMiths and see a Quality Solicitors firm when shopping on a Saturday. From a marketing perspective, I think the approach Quality Solicitors have taken is commendable. They have obviously invested money in pushing a national brand and aim to get themselves noticed by consumers and business. However I have been thinking about the WH Smiths side of things and wondering how much of the scenario played out on the front of the flyer is actually ever going to happen. The last time I needed a solicitor it was for commercial litigation. I looked at http://www.legal500.com/, found the local firms recommended for the work, checked out a few websites to see who was up to date and contactable by email and then called a couple for a price. I spoke to partners on both occasions and got competitive quotes. My decision to go with one firm rather than the other was based on price at the time. The previous time before that was for a will. I looked at http://www.legal500.com/, found out who the highly regarded local firms were, called up and spoke to a legal executive and booked an appointment once the price was established. This was based on expertise and reputation, both very easy to research now on the web with online directories and forums. Personally I am not sure a consumer or businessman would ever want to discuss a legal issue with a lawyer, paralegal or sales person in WHSmiths (my apologies to Quality Solicitors - I couldnt tell from your ad which of these would be present - please email to add into the article) on a shopping trip on a Saturday. My wife would probably have kittens for starters, and I wonder whether people will think that the business is claims management or some sort of franchise being operated like a will writers business. Would I get to speak to a partner or solicitor immediately in the same way I did when calling up on the two occasions given above, or simply someone manning the stall and making appointments? Of course only time will tell whether this is a shrewd move or one that backfires. It would be interesting to know how much business DHL pick up from teaming up with WHSmiths for parcel delivery services. I go into WHSmiths to buy Private Eye, browse books, go to Costa Coffee, look at the games or get a gift card - legal services? I'm not sure. Will the brand pick up passing trade and get business this way? It reminds me of the RAC and the AA manning stalls outside service stations. How much business comes in from that particular activity? Does it add anything to the brand to be teaming up with the service stations to sell breakdown services to anyone passing or do they just tend to sell to someone desperate at that moment as they think their engine is about to blow and their subscription has expired? I have not written this article to criticise Quality Solicitors and if anyone from the company or an individual law firm within the group would like to comment, please note that I will post this news item onto the http://www.legalrecruitment.blogspot.com website - all comments added (provided they are not from SEO companies trying to boost rankings!). Labels: WHSmiths - the new place for legal advice? Career coaching is a fairly integral part of our business and something we have been doing since 2001. Quite a few of the people who come to see us are solicitors who have completed betweeen 3 and 5 years post-qualification and disillusioned. One of the most popular queries is: "surely there is something more to life than this?". Getting out of the legal profession is similarly a very popular topic that we spend some time advising on. If you are considering this yourself, please bear in mind the following quick advice. Lawyers tend to fall into two categories. 1. Those who think they want to leave the legal profession but actually have problems in their workplace. 2. Those who have no problems with the work place but actually thoroughly dislike law and the legal profession. It is important to differentiate between the two situations if you are considering your own position. Highly paid London solicitors often want to leave their jobs because although they are very well paid they work long hours or there is a partner causing problems at work or systematically bullying staff. Lowly paid high street solicitors often want to leave the profession because they are badly paid. High street solicitors want more money, commercial solicitors want more time. http://www.lawcare.org/ have a good list on their site of alternative jobs and professions lawyers have gone into that may be of interest. Some solicitors feel trapped as any advice sought is often met with well-intentioned "are you sure, seems a waste to leave after all that training." We have two dates available in the next 4 weeks in central London - 24th May and 1st June.